We highly recommend that you arrive early before our actual trip begins to explore Hanoi, one of Asia's most fascinating cities and certainly it's most walkable. Like Paris, every street presents new activity, interesting shops and sights. If you arrive a with a couple of days to spare, kayaking on Halong Bay, a UNESCO World Heritage Site, is an unforgettable experience. After arrival in Hanoi, we'll enjoy a local herbal spa, soaking away the long flight and enjoying a massage. Combined with a bowl of piping hot pho (soup) afterwards, you'll discover we've found the perfect cure for jet lag. 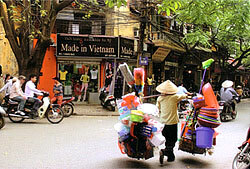 Hanoi, the cultural and political capital of Vietnam has slumbered unchanged since the sixties. Step back in time on the French-built, tree-lined boulevards and old quarter, continuously inhabited for over 1,000 years. Hanoi's cuisine is heavily marked by Chinese influence and tradition more than other regions and we'll delve straight into the heart of it. After introductions and meeting over refreshments, we'll set out to explore the local markets with our chef and Hanoi culinary expert, learning about various unique ingredients that comprise cuisine of the north. Before lunch, we'll enjoy a thrilling cyclo (pedicab) ride around the thousand year-old and former French Old Quarter, taking in Hanoi's more interesting landmarks, including the Ho Chi Minh Mausoleum (where Uncle Ho lies in state). We'll take in lunch today at longtime favorite place, the 5th-generation family restaurant Cha Ca Va Long, dining Cha Ca fish specialty. Well also enjoy a delightful "survival Vietnamese" lesson, learning a few essential phrases to carry us through the rest of our trip. In the afternoon, enjoying a unique Hanoi tradition of bia hoi, or happy hour, at a local cafe with draft beer and snacks. 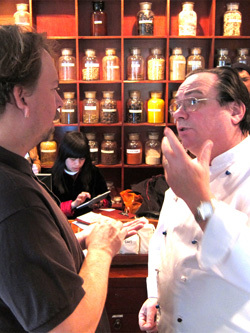 evening, stopping in to visit "le chef" Didi Corlou (right), the long-serving Metropole head chef at his French-Vietnamese restaurant La Verticale, touring the kitchen, sampling dishes and hearing about chef Didi's interesting take on Vietnamese peppers and spices. After an early morning flight, we arrive in the ancient Imperial Capital of Hue. 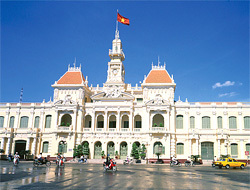 Sleepy Hue, Vietnam's most tranquil city remains largely unchanged by economic expansion in the south. 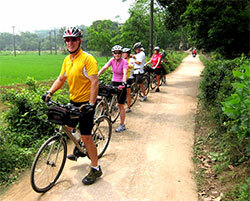 After bicycle setup, we'll venture out onto the boulevards along the Perfume River, pedaling through the Imperial Citadel — memorable to most Americans from the vicious, month-long fighting that took place here during the 1968 Tet offensive. We'll also visit Thien Mu Pagoda, Vietnam's most important Buddhist monument. 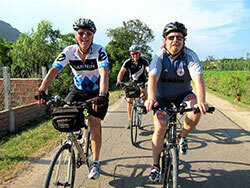 After arriving in Hue, bike testing, followed by an orientation ride additional ride along the Perfume River. This evening, dining along the river savoring Hue's distinctive dishes including the famous bún bò Huế, an unusual spicy, brothy soup listed on restaurant signboards throughout the country a heavenly relative to bún riêu cua, a tomato broth soup topped with crab or shrimp paste. Accommodation at La Residence. Time to ride! After breakfast, we'll enjoy a leisurely morning spin outside of Hue to visit two of the finest examples of Imperial architecture, the Tu Duc and Khai Dinh Royal Tombs. 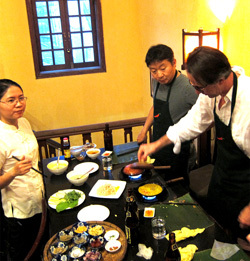 Afterwards, option to return to Hue by traditional dragon boat while the crew demonstrates preparation of Hue specialties, such as banh xeo — a Vietnamese crepe. Others may continue on a long ride outside the city. In the evening, hands-on cooking with the wife of a Hue royal ancestor, preparing Hue delicacies in their traditional home. This morning we'll ride across the Perfume River, entering and weaving through the Imperial Citadel on our way out of town, heading towards the coast. After reaching a side route, we'll enjoy a wonderfully scenic ride along a beautiful coast passing emerald green rice fields fronting blue lagoons. Here are also white dunes, covered with colorful tombs, and small villages and farms. After a couple hours of flat, meandering riding, we'll pause at Lang Co Lagoon for a seafood lunch before — uh-oh — conquering the six-mile Hai Van Pass (below). Thankfully, the pass was graded gently and is also now closed to motor traffic. After pausing on the summit for panoramic views north to Hue and south over Danang, we'll descend then continue onto Hoi An, skirting busy Danang and out to the coast again south to Hoi An, a quaint town that is typically everyone's favorite stop in Vietnam on this tour. After arrival, freshening up at the resort before heading into town to stroll around before Dinner at the busy Miss Ly's where we'll share cooking duties in the chaotic kitchen. Hoi An is the home of cau lao soup, a delicious pork and noodle soup typically topped with deep fried "croutons" and a dish called white rose, a style of won ton. In the evening, we'll check out one of the town's new lounges, popular with younger locals and travelers alike. Accommodation at the Victoria Beach Resort An or Nam Hai. Note: Ride noted here is full distance, typically most ride about half this distance). 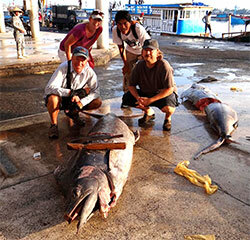 Today, rise before dawn to witness local fisherman arriving at the market to sell their night's catch. After returning to our hotel for breakfast, exploration of charming Hoi An by foot or biking outside of town to explore rural villages and sights in the area. After lunch of traditional Cao Lao pork soup and banh xeo, prepared by our Iron Chef, we'll start our Iron Chef cook-off! Today is our Iron Chef competition! We'll pair up with partners, draw random Vietnamese recipes and then head out into Hoi An's markets to collect our ingredients. 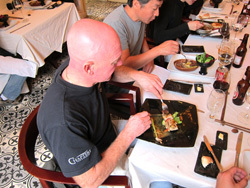 Afterwards, returning to the Miss Vy's Morning Glory restaurant where we'll cook up our dishes. Chef Miss Vy and Neal will grade participants and we'll crown a new Iron Chef : Vietnam. In the evening, we'll celebrate, soaking up the atmosphere in one of Hoi An's trendy new lounges. Our epic ride begins early (yes, this ride really fits that overly-used term), departing Hoi An shortly after day break by van driving well past Quang Ngai to reach the pleasant side roads that will take us to Qui Nhon (about three hours). 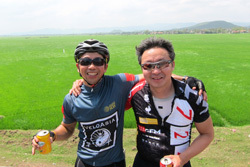 After arrival, we'll down shots of "depth charge" coffee before cycling the meandering roads passing through the pleasant countryside, rice fields, farms and small villages (photo right). This long day ends with arrival at the former American port base city, Qui Nhon, where dinner will feature local specialties as lemongrass chicken baked in palm-leaves (although a cold brew after this long day will be an equal highlight of the meal). The Life Resort, located on an empty beach cove offers splendid massages. Accommodation at the Life Resort Qui Nhon. Our ride from Qui Nhon to Nha Trang covers some of Vietnam’s most scenic coastline, featuring blue lagoons with stone promontories overlooking the languid waters below. Fishing villages under rows of palms dot the coast here, their bays filled with brightly colored boats. Not many travelers here, so lots of attention can be expected. Lunch at scenic Dai Linh Beach. Arrive at resort along the waterfront. After a brief dip in the pool, dinner of local seafood. Evening free for "red rhum" cocktails along the waterfront and to enjoy the first signs of nightlife we've seen on our tour. Accommodation at the Ana Mandara (luxury option). We'll rise early to visit the seafood market at dawn where fisherman are busy bargaining with distributors. After roaming around the busy market and taking some choice photos, we'll return to our hotel for breakfast. After depart early for a "three-hour tour" boat excursion to nearby islands and a marine reserve. Snorkeling and swimming over the coral reefs in warm, clear water, followed by sunbathing and a delicious grilled seafood lunch. 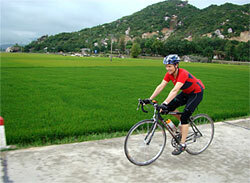 After return to dock, optional city cycling tour, including Lon Song Pagoda and Po Nagar Cham ruins. Evening free to walk along the beach, have a massage or swim in the warm surf. Arranged dinner, featuring shrimp spring rolls, fried squid with pineapples, steamed crab, fresh fish and other seafood delicacies at the famous Lac Canh, a Nha Trang institution for over 20 years. Afterwards, enjoying one Nha Trang's specialties — massage. 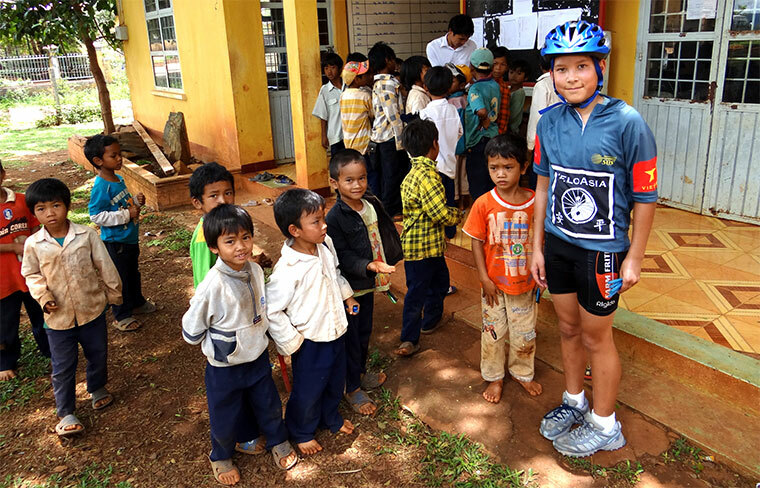 For bikers, today offers a grueling 18-mile climb during our ride from the coastal plain into the Central Highlands with rollers following all the way into Dalat (profile below). About 72 miles and 8,000 feet of elevation gain door-to-door... ouch! Of course, the more sane of us will shuttle to the top or part way, sipping champagne later on the veranda at the Palace Hotel (top) while giving a big thumbs up to the few hardy riders that roll in. This quiet country road into Dalat passes through beautiful pine forests of the area around Dalat, passing small villages and strawberry, carrot and other specialty crops lining road passing into Dalat. Luxury accommodation the majestic Dalat Palace, restored in perfect detail with expansive views of Dalat valley. Dinner at a local family restaurant featuring specialty crops grown in this fertile, high-altitude region. A half-day bike ride, visiting Dalat's more interesting sites, including the lake area, central market (one of the most fascinating in Vietnam and a great place for souvenirs, such as cobra wine), and the eccentric Valley of Love. We'll pause for a delicious lunch near the central marketplace featuring Chinese and Vietnamese favorites. In the afternoon, enjoying a leg massage at the hotel or relaxing on the terrace, savoring views of the central lake. The jewel of Vietnam, Dalat was where the French came for relief from the humid heat of Saigon and hundreds of well-preserved colonial villas dot the hills. It was also a center for exotic game hunting (Teddy Roosevelt visited here). Tonight we dine in luxury at the sumptuous Dalat Palace, impeccable restored, enjoying the set menu featuring classical French and Vietnamese dishes such as duck confit. We're all good friends by now, and Dalat is the perfect place for karaoke, Vietnam's most popular entertainment. Today, two options, one flying to Saigon for early sightseeing and the other extending time on the bike with a long day back to the coast (bottom) and transferring by bus to Saigon. This morning we'll pack up our bikes and enjoy our last moments in Dalat before transferring to the airport for flight to Saigon, the busy commercial capital. After arrival, we'll venture out in the central district to visit historic sights, including Ben Thanh market, colonial-era post office, and reunification palace. After, strolling the downtown boulevards, exploring shops, galleries and street stalls before dinner. Our farewell dinner is at a lively, outdoor restaurant featuring food stalls cooking up a variety of dishes planned by chef Neal. 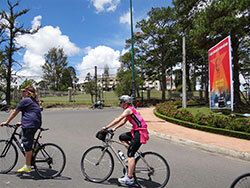 If we are riding, from the cool climate of Dalat, enjoying a welcome descent, all the way back to the coast today. After breakfast, we immediately drop down a steep, twisting six-mile descent from Da Lat through pine forests to the rolling and gradual descending road through the towns of Ta Nung, Lam Ha and onto Duc Trong at kilometer 50, passing coffee, tea, banana and rubber plantations planted in the rich, red earth that marks the Central Highlands as the place where Vietnam's finest tea and coffee and other specialty crops are grown. Our van will pick us up at Duc Trong and transfer us about one hour to Di Linh to avoid heavier traffic along here (or we can ride the 40 kilometers if desired). After Di Linh, we'll turn off on quieter Highway 20, mounting our bikes again for the last 90 kilometers to coast, starting with an easy 10-km climb to the summit of Truong Son mountains, then rolling through tropical forests and small towns to Gia Bac, a small hill tribe village, then down hill to sea level at Phan Thiet. After arrival in Phan Thiet, we'll have a quick shower and lunch before the three-hour drive to Saigon. In the evening, enjoying one of the city's finest restaurants for our farewell dinner. 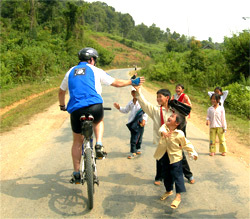 Note: this day we'll stop at a small hilltribe village to meet with teachers and provide much-needed school supplies. This is a delightful visit and interesting meeting with local people who are not Vietnamese. Depart Vietnam or continued travel onto Siem Reap tor our popular grand temples at Angkor tour. Hen gap lai (see you again)! Thank you for traveling with us! Please verify actual flight dates and times on ticket. Regional tickets issued in-country.